As the cost of marketing rises, its effectiveness is in decline. CEOs want a return on their marketing investment, but can't be sure their marketing efforts are even working. Truly, marketers have to shape up or watch their business go south. In this clear and comprehensive guide, renowned marketing expert Philip Kotler identifies the ten most common-and most damaging-mistakes marketers make, and how to avoid them. But these ten mistakes are much more than simple mess-ups; they're glaring deficiencies that prevent companies from succeeding in the marketplace. 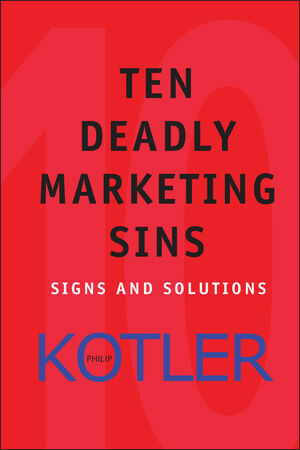 In Ten Deadly Marketing Sins, Kotler covers each sin in-depth in its own chapter and offers practical, proven guidance for reversing them. Marketers will learn how to stay market-focused and customer-driven, fully understand their customers, keep track of the competition, manage relationships with stakeholders, find new opportunities, develop effective marketing plans, strengthen product and service policies, build brands, get organized, and use technology to the fullest. Covering crucial topics every marketer must understand, Ten Deadly Marketing Sins is a must-have for anyone who want to remain competitive in an increasingly challenging marketplace. Packed with the kind of marketing wisdom only Kotler can provide, this is an indispensable resource for every company-and every marketer-who wants to develop better products, better marketing plans, and better customer relationships. Ten Deadly Marketing Sins is an unbeatable resource from the most respected thinker in modern marketing. Philip Kotler (Chicago, IL) is the S. C. Johnson Distinguished Professor of International Marketing at Northwestern University's Kellogg Graduate School of Management and the author of 15 books, including Marketing Insights from A to Z (0-471-26867-4) and Lateral Marketing (0-471-45516-4), both published by Wiley. PHILIP KOTLER is the S.C. Johnson Distinguished Professor of International Marketing at Northwestern Universitys Kellogg School of Management and the author of thirty books, including Marketing Insights from A to Z and Lateral Marketing, both available from Wiley. Introduction: The State of Marketing Today. Chapter 1: Your Company Is Not Sufficiently Market Focused and Customer Driven. Chapter 2: Your Company Does Not Fully Understand Its Target Customers. Chapter 3: Your Company Needs to Better Define and Monitor Its Competitors. Chapter 4: Your Company Has Not Properly Managed Its Relationships with Its Stakeholders. Chapter 5: Your Company Is Not Good at Finding New Opportunities. Chapter 6: Your Company’s Marketing Planning Process Is Deficient. Chapter 7: Your Company’s Product and Service Policies Need Tightening. Chapter 8: Your Company’s Brand-Building and Communication Skills Are Weak. Chapter 9: Your Company Is Not Well Organized to Carry On Effective and Efficient Marketing. Chapter 10: Your Company Has Not Made Maximum Use of Technology. Epilogue: The Ten Commandments of Marketing Effectiveness.